It has to permeate through every element of the workplace, including the all-important training. Height and safety (yes, the title of this article is a play on words) are often enforced bedfellows when they should be inseparable. Of course, no-one should be working at height without extensive training and strict operational procedures but the ebb and flow of the annual HSE accident statistics for this sector suggests the battle for the routine delivery of responsible behaviour when operating at great height or in areas of difficult access has not yet been won. There is no-one working at height who does not believe they are working safely, unless they are employed by a grossly irresponsible company, are an individual amateur, or work in a country where no attempt is made to set standards and implement them. The Work at Height Regulations of 2005 quickly applied themselves to organisation and planning, to competence and the avoidance of risk and then placed great store by the selection and inspection of equipment, thus providing an almost fool-proof checklist for those undertaking such work or directing it. But the very fact that many have assumed their own competence based on this simple document is a danger in itself and, as time has passed, even this basic advice has become too often ignored. The result has been disappointing variations in such accident statistics that get through the reporting procedure and into the various documents issued by the HSE, trade associations and consultancies. Even so, effort and money expended on good practice seems to be for ever needed to be balanced against revenues and profits whatever formal legislation or advices is issued, and whatever warnings are given... but good sense and safe working must prevail. From the desk of this writer there would be encouragement for every company operating in a sector where an efficient and effective trade association exists should seriously examine its reasons for NOT joining that organisation. Strong trade bodies have the potential to raise standards and drive forward a safety regime; the more that remain outside such bodies the less influential the whole sector becomes. But then I have to acknowledge that not every such group displays the level of moral and professional leadership it should and if it is not actively involved in the training of workers in its sector then it may have limited value. Those trade groups that design and deliver training are at least conscious that they are preparing people to work on their machines or apparatus so they must surely be aware of the dangers of inadequate training. And of all the industrial work practices surely operating at height brings with it both the greatest challenges and the most awesome of responsibilities for it is not a natural human trait to put one’s life in danger. Thus, those working at height or in areas of difficult access should all sign up to training and working to a procedure that is proven, fit-for-purpose and properly executed. "industrial work training should be specific, and offered by professionals in the actual disciplines being taught"
Training?..... that’s easy, just practice! The greatest sin within industrial training is to not have a fixed syllabus that has been shown to deliver a capable work force. The second greatest sin is to not allow that programme to be as flexible as is necessary to allow for the variation of skills, confidence and physical attributes likely to exist on any course. It is, incidentally, also a crime to judge a candidate to be capable before he has completed the course... you probably have an unsuitable course design if fatigue or lack of concentration are not most common towards the end of the instruction. And it is downright foolish to allow errors to be repeated because ‘practice makes perfect’ rather than stop the training, instruct afresh and check the error has been eliminated. In IRATA International we are often training men, and women, who will operate at great height - we have worked on Big Ben, the Forth Bridge and the highest buildings in Dubai, and Las Vegas, and in the testing conditions of oil and gas platforms - as well as in areas of most difficult access. The movement of our rope access people around the structure they are inspecting, cleaning, repairing or renovating will be undertaken entirely on the two ropes they use to move up, down or across to their work position. This very original means of working-at-height remains remarkably safe, far more so than many of the machine-based alternatives where they exist, but it has only become so because of a slavish adherence to thorough training, independent assessments, regular re-training and complete and specific work procedures. As an international Association it is imperative that IRATA training delivers consistency and accuracy wherever in the world it is offered. Industrial work training should be specific, and offered by professionals in the actual disciplines being taught. General work-at-height skills may start someone in the right direction if he is to climb a simple ladder but for the more sophisticated procedures and equipment a full training regime is required, even for more advanced ladder work. IRATA delivers its training courses through its own training member companies around the world - they are experts in their field, from their training staff to the structures they train on - and a full one-week course is needed for each grade. Furthermore, IRATA rope access courses are completed by an IRATA Assessor, who is completely independent of the Training Company, evaluating all trainees and deciding whether they pass or fail. You wouldn’t expect to find your driving instructor to be the one who should decide whether you have passed your test or not, but it is, unfortunately, more often the case that the industrial trainer judges his own pupils and that is never likely to raise standards. The ‘once-over lightly’ training that is too often the norm in industrial training is based on the surmise that new workers can ‘learn on the job.’ This is a claim that is easy to defend... because it is true! But it is a dangerous creed to follow, with ‘dangerous’ being operative word here. The necessary knowledge for most industrial work, including that at height, can be divided into the practical and the theory and it is here that the real test of training methods comes into play. Many industrial bodies working in access will consider off-site training to be ‘down time’ where workers are not earning their wages and many will put forward the view that ‘live’ work is the best means of progressing knowledge of the ways and means of how to do a job. There is, of course, no denying that we all learn more once we are actually at the ‘coal face’ than we do in any classroom or training centre but it is also a certainty that a lesson learned early is a good practice that will stay with you for ever. It is often the case that a superficial approach to training betrays a simplistic operational procedure that may contain in-built dangers that cannot be found out before it is too late. The secret is that if work procedures are sufficiently detailed to deliver safe working, they surely demand a good degree of training to make them the essential key to the effective process that they should be. If a worker can be adequately prepared for a workplace following a few hours of unregulated training, perhaps in an all-purpose training centre, then the working practices he has to follow must be so superficial as to be meaningless. "work-at-height will remain a major industrial work sector for the foreseeable future"
And what is often overlooked is that a well-defined and work-proven operational procedure is not an obstacle to fast learning and effective working but the very fact that guarantees it! A confidence in the rules that direct your work improves overall performance and generates a culture of safe-working, and that is quite useful when you are stabilising a rock face or suspended twenty-five floors above a city street. We all acknowledge the value of experience but all too few industrial companies and their guiding Associations sign up to the belief that you can not only teach an old dog new tricks but that you absolutely must! Confidence in your ability to work safely is good, provided it is not based on the apathetic attitude that what you did, and how you did it, twenty years before is still valid and cannot be improved upon. Even a procedure as simple as working on ropes, where no motive power is involved and precious few changes are made to equipment and work practices, it is still necessary in the views of my Association that regular re-training should be a requirement and not just an option. IRATA rope access technicians are required to re-train every three years and this is not done to gain greater revenues for our training companies but to ensure the people concerned are up to the tasks they will be asked to complete. With some of the crazy designs on our skylines, an increasing range of tasks that IRATA rope access is asked to undertake, and simply because we look to constantly improve our work methods, it is necessary to guarantee the ability of our technicians. And this re-training has to take place whether or not the workers concerned are looking to move up the grades of qualification. It is a certainty that work-at-height will remain a major industrial work sector for the foreseeable future and that, despite Man’s ingenuity, most means of undertaking this work have their drawbacks and safety issues. Amongst the problems encountered is the basic one of many contractors, facilities management companies, councils and other building authorities having basic in-built concerns with commissioning any work-at-height. This can lead to some bad or misguided decisions, though the more informed will soon assess the best option for them. Another major factor, and one that has brought about considerable changes of policy, is the environment. Most cities, with their high-rise structures close to their centres, are heavily congested and it is not good for the business world or general population when their access to work, shops and entertainment is blocked by access machinery. Traffic diversions, polluting access machinery, blocked footpaths and the security risks posed by machinery parked in situ overnight are all problems created by some forms of access. We can all recall instances where structures or machinery have caused accidents but sometimes there is not always an alternative to ranks of scaffolding or high cranes. If alternatives to motorised access are needed then one to consider is rope access and for the reasons already stated - minimal disruption, smallest possible exclusion zones and zero security concerns. The range of work rope access can undertake is broadening all the time and surprises many and a good number who employ it for the first time are invariably lavish with their praise for the ease with which the work was done. The comment - ‘we barely realised there were workmen on site!’ - is commonplace and the added assurance that the work is being accomplished safely is a treasured bonus. "a suitably trained technician can transport himself around the face of a building, a steel structure such as a bridge or pylon, and a host of many more complex locations by means of his anchored ropes, with assistance of motive power"
IRATA International and its member companies field ever more enquiries from designers and architects seeking to establish whether the use of rope access can enable them to include a particular feature in their plans, often having been told they cannot by consultants and other advisers. But, if you have undertaken work on Tower Bridge, the London Eye, the Sydney Opera House, the CN Tower, the Spinnaker Tower and many other similar design icons, there is not a great deal of architectural access challenges you cannot meet. It is necessary for the reader of this article to understand that the IRATA-trained and IRATA-employed rope access technician does not fall. As one of the very few Associations in the sector to obtain work data from all its member companies and have it independently audited into a comprehensive Work and Safety Analysis by a former HSE senior, IRATA International can claim to have zero deaths whilst working on rope in the 18 years of these reports and have every issue of these statistics show a reportable incident rate that is far below the industry norm. A suitably trained technician can transport himself around the face of a building, a steel structure such as a bridge or pylon, and a host of many more complex locations by means of his anchored ropes, with assistance of motive power. Overhangs, slopes and crevices do not present the problems they do to static access frames or even mobile platforms or cradles. Indeed, the adaptability of the rope technician is almost without limit and work is now done on ropes that was previously the territory of other access procedures because, as well as flexibility and adaptability, the speed of set-up and dismantling of rope access is a valuable commodity in these cash-conscious times. Window cleaning and other basic repair and renovation work is a significant part of rope access work but spray cleaning, blasting and complex drilling can all be accomplished from ropes. Once the work has his overalls, his ropes, harness and ancillary climbing equipment plus the compulsory helmet he is ready to go for much of his work. If more heavy duty tasks are to be undertaken then Kevlar boots and gloves may be needed along with goggles or other eye/face protection but even for grit blasting and extensive painting or drilling work, the rope access operative can transport his materials around the site on his ropes. The aforementioned Work and Safety Analysis will highlight any accidents or injuries caused by inadequate PPE, though it is more likely that extra attention will be drawn to the need for extra caution for certain tasks. It has been explained that IRATA believe that training for work-at-height should mirror the circumstances that the technician will experience on his first working day and beyond. This cannot mean conducting a training course on Tower Bridge or Wembley Stadium but every challenge the rope worker will encounter will be replicated as best it can and the key to this is inducing a safe working culture that will stay with the trainee for his career. Too much industrial training is undertaken in situations that anaesthetise the workplace and encourage a false sense of security. Most IRATA training member companies enable their trainees to get to 20ft above the ground in their first course, some offer far greater heights and not all practice will be carried out against a solid wall. Of course, the prospect of a fall from even 20ft onto a concrete floor is guaranteed to concentrate the mind! Each training course is in the hands of a rope access expert as IRATA are specialists and not ‘general purpose industrial trainers.’ Because 100% of IRATA trainers have been full-time rope access worker they have experienced their own ‘first day’ on ropes, the challenge of gaining higher skill levels and they will have practised every rope manoeuvre a thousand times. 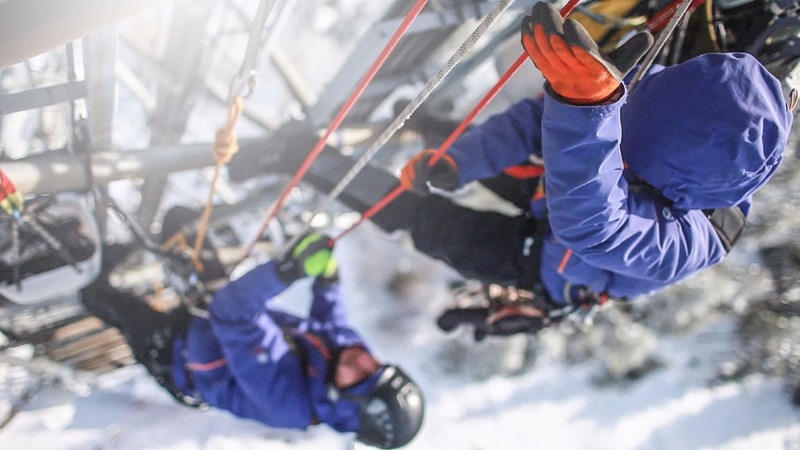 They will be able to show how competence can be quickly gained and how the ability to rescue, and be rescued, is a necessary element of confident work-at-height. Every training candidate will be quickly inducted in the safe working culture that IRATA breeds. If haste, corner-cutting and lax procedures are part of the working day then accidents will happen as they will if over-confidence is allowed to swamp thoughts of caution and correctness. The fact that IRATA’s record of safety has been hard earned and must not be sacrificed to a lowering of standards is imbued into each new technician who will then carry the safety ethic into his first job and, invariably, every job thereafter. He will have a mind for responsible working based on the tough message that only with safe working in mind will he enjoy a long and accident-free career. There would be no need for a Falls Team at the HSE or a ‘Slips, Trip and Falls Campaign’ if all those who worked at height did so safely. The impactful ‘Shattered Lives’ initiative was laudable, and shocking, though it would have been good to see some acknowledgement that some, if certainly not all, have long since learned that every life is too precious to risk it for reasons of expedience. Saving money seldom saves lives at work and a commitment is necessary at the core of all height training and operations. A nod and a wink to the daily tool box talk, rather than a focused run-trough of the day ahead, can be as dangerous as a poorly erected access structure; an inadequately-trained ‘new boy’ may kill or injure others than himself and no manner of personal protection equipment will save an idiot and one piece of unchecked kit is a lethal weapon. Because few can claim they are confident at height it is right that most of us leave such work to experts. Where we can have a role to play is in urging the employment of methods that have a proven track record of planned and thorough training, and regular re-training, and an operational record that is endorsed by attention to detail and audited reports evidencing safe working.